The flag of the Confederacy is once again flying over graves at the West End Cemetery near the Tarleton State University campus, where, 90 years ago, officials exhumed and relocated the bodies of African Americans who were once buried there. Joyce Whitis, an organizer for the Sons and Daughters of the Confederacy, says the flags are her organization’s way of showing respect to the Confederate dead. Joyce Whitis explains the purpose of placing Confederate flags on graves at West End Cemetery. The Sons and Daughters of the Confederacy say it is their way of showing respect for the Confederate dead. 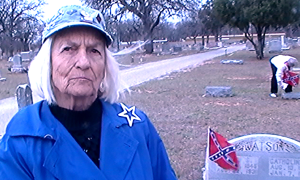 Whitis and a few other members of the Maj. George B. Erath 2679 Chapter of the Sons and Daughters of the Confederacy placed the flags on the graves a few days before the beginning of April, which Texas designates as Confederate History Month. The Texan News Service first reported in Feb. that in Apr., 1922, city officials voted to remove the remains of numerous African Americans who had been buried in West End Cemetery. The remains were relocated at the newly established Mt. Olive Cemetery on College Farm Road. “The city of Stephenville’s board decided to make a black cemetery, so they dug up the blacks that were buried here [West End Cemetery] and moved them to Mount Olive,” Whitis said. The first person to be buried in the segregated cemetery of Mt. Olive was Wallace Howell, a Confederate veteran who was African American, according to Whitis. She said her group used to place flags on the graves of Howell and other African American veterans, but quit because they were either destroyed or missing. Whitis said the same organization has also created placards that will be placed outside of the 57 cemeteries in Erath County, where some 600 Confederate veterans are buried. Editor’s Note: This story was updated on April 12 to correct the spelling of Wallace Howell’s name.